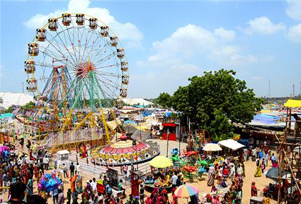 In the month of November, pilgrims in huge numbers make their way to the Shamlaji fair. People visit Shamlaji fair to take a holy dip in the pious Meshwo River, which looks best during the festival, sparkling and pristine. Goddess Shamlaji, whom tribes call Kaliyo Dev (Dark Divinity), is revered by the people of Tribal community as they have faith in the power of the divinity. During the festival, one can see barter of silver jewellery, clothes, house items and many other household items. Shamlaji is small shrine on the bank of Meshwo River. It is one of the rare temples of Lord Krishna where cow idols are also worshipped depicting his childhood as a cowherd. Built of sandstone and brick, this two storey architecture is believed to be 500 years old. Exteriors walls are adorned with frescos that depict episodes from the epics- Ramayana and Mahabharata.